It’s A Great Day for Hockey!! 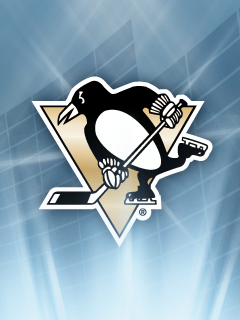 I’m a huge fan of the Pittsburgh Penguins. Many are amazed by my obsession since hockey is notorious for being tough. Bully-ish, perhaps. Me? I’m the type of gal that frequently hears “Here you go, sweetie!” even from otherwise formidable looking people. Today is the first Pre-season Game against the Red Wings, and I’m bouncy in my seat as if this were an “official” game. I’m hoping for a winning season, of course, but more than that I’m hoping that we’ll come out of this season with fewer injuries than last year. Last year dealt us a tough hand and it’s still touch and go with some of our players. What draws me to the game is the speed and the skill. It honestly isn’t the fighting or the hits. I listen to the games through the Pens Radio station so any physical action doesn’t translate well when you can’t see what’s happening. In fact, fighting slows down the action in my opinion. I realize that this might not be everyone’s view, but I love it when plays are set up and executed. It doesn’t hurt that I get to hear the exceptional Mike Lange call the games. I love to hear his play-by-play commentary rather than the televised commentators. I even tried to watch a game with the sound muted but with Lange’s commentary. Unfortunately it didn’t work due to the televised delay so I just turned off the televised game and listened to it. Trust me, it’s the best way, outside of going to a game, to experience hockey. A small goal of mine? To see a Penguins game, live. I went once when I was really young, but I’d love to go to Pittsburgh and absorb the hockey LOVE. This pie is delicious! I say this even though I hate nuts and the crust incorporates nearly a cup of chopped walnuts. Normally I wouldn’t make anything that needed that many nuts (or any nuts other than sliced almonds), but this pie looked and sounded yummy. So, to deal with the nutty problem, I pulverized them until it was more like walnut flour than chopped walnuts. There’s also chocolate in the crust and coffee in the filling. And to top it all off? 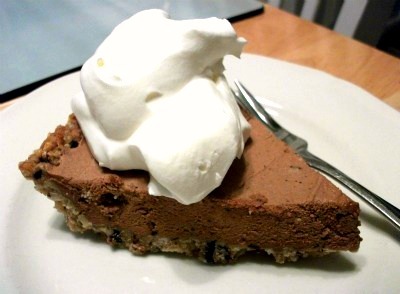 This pie is frozen and then topped with yummy whipped cream (or cool whip in our case). Don’t be put off by the “butter” in the title. There’s only a stick of butter in this entire pie. That’s less than some cookie recipes. It also blends well with the other ingredients so it doesn’t dominate. I used half the package and it worked just fine. 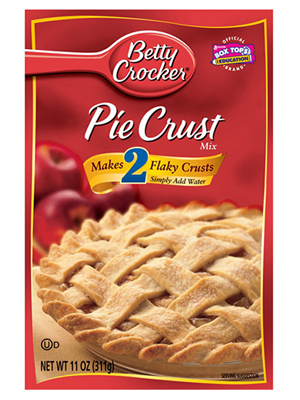 I would have liked to have made my own pie mix and might see if there’s a “homemade” version of this boxed mix for the next time I make this pie. Mix together in a large bowl the mix, chocolate, sugar and walnuts. In a cup, mix the vanilla and water then drizzle over the dry mixture. Press mixture into the dish and up the sides. Bake for 15 minutes and then remove and cool. Cream the butter. Gradually add the sugar and beat on high speed for 2 to 3 minutes. Add the chocolate and coffee. Add the eggs 1 at a time and beat well. Pour the filling into the cooled crust and freeze until solid. After it’s frozen, carefully remove the pie from the foil and replace pie in pan. Serve with cool whip or whipped cream. You can get fancy and follow the book’s suggestion of whipping 1 pint heavy cream, 1 tbsp instant coffee (ground to a powder) and 1/c cup confectioner’s sugar. I didn’t do that so I can only vouch that this pie was delicious with the cool whip – it’s probably doubly so with the whipped cream. Categories: Musings, Recipes | Tags: baking, hockey, Musings, Recipe | Permalink.